You can say it was about time to see a service for leasing and renting mining rigs for Ethereum and other forks that use the Dagger Hashimoto mining algorithm, so here comes the new service called Rigs Online. Interestingly enough the larger and more established services did not bother to add support for Ethereum hashrate leasing and renting, so somebody else apparently had to do it. The service is still in beta and has a bit limited functionality initially, but it does already work and works pretty good based on our first experiences with it, though there are some issues as well that need to be worked on. Everyone can register and either rent an available mining rig if the price is acceptable or add his own mining rig to sell the extra hashrate he has available. The service accepts Bitcoins only for the payments and when you send coins to your account you will get them available for use just after 1 confirmation, however for the moment there still seems to be no function available to withdraw any earnings or coins left in your balance. 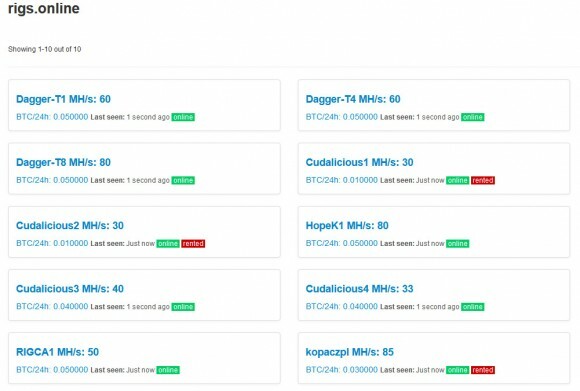 When you want to rent a mining rig you choose it from the list of available ones that are not yet rented fill in some details on where you want to have it mine. So far it seems that only Suprnova is supported and you can choose to mine in their ETH, SHF or EXP pools then you need to set a worker you have already set in the respective pool, and the time you want to rent the rig for – can be for less than 24 hours, though the prices are listed in 24 hours. It would probably have been better to just paste the full pool URL for mining than to have just a dropdown, but this is probably to make it possible to have less mistakes. Unfortunately for the moment there is no option to edit the settings once you rent a mining rig, so if you make a mistake in the setting up then you cannot fix it or if you want to switch the pool at some point. Another thing that is not yet very clear is what happens when a rig you have rented for a given time period goes offline before your renting period is over. 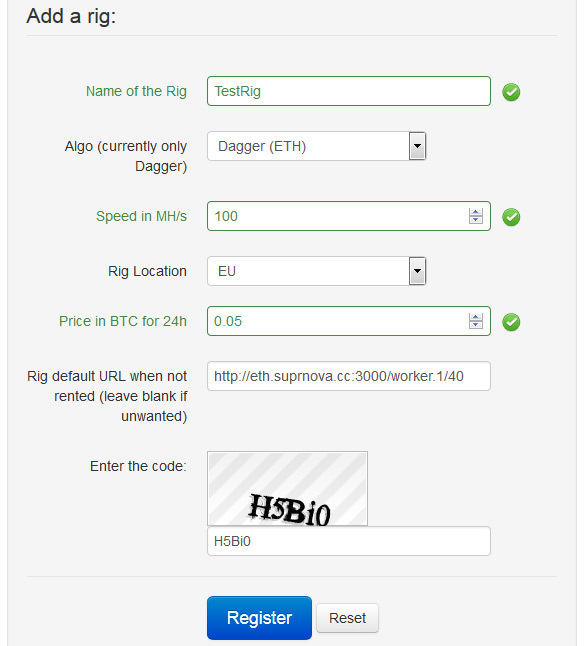 It is not clear if you will be compensated in any way for the downtime or you will only loose your money, so at if you decide to test the service at the moment do not rent rigs for too long periods. Another thing we are currently missing in the service is a comment for and rating system for rigs, but hopefully we are going to see something like that added in the future as well. If you want to lease the hashrate of your Ethereum mining rig you go through a simple setup process similar to that of the renting of rigs. 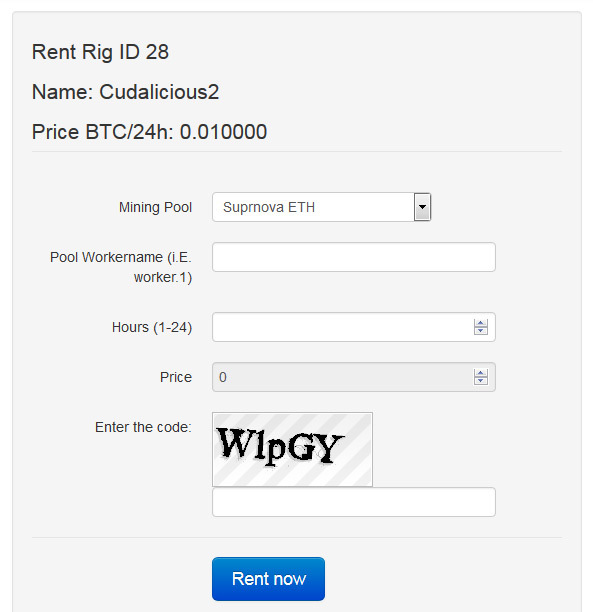 Here it is very important to setup a default pool URL where your mining rig will be mining at when it is waiting to be rented by somebody. Here you can set a full pool URL with the default example set for Supernova, but you should be able to use different pool as well. Unfortunately with the rig renting here you also don’t have the ability to edit your rig once you set it up, so if you want to change something you need to setup a new mining rig available for renting. After you add your mining rig to sell your hashrate you will need to point the ethminer on that rig to a special URL that will be given to you pointing to the Rigs Online service – apparently a proxy that handles the renting process and switching between your backup pool and the user’s preferred mining pool when the rig is rented. So in short the Rigs Online service does look promising, however it currently comes with the very basic functionality available and there is a lot of work needed to still be done. It is promising, but still in beta and there is more work needed to be done before it becomes fully functional and offer all the things that you will normally expect from such a service and still the lack of withdraw function is bothering us. So you are welcome to try it, but you should only do it with a small deposits in order to be able to try renting a rig or you can try adding your mining rig as a quick test.